To post a new deal, go to the Add New Deal page from the main menu. Afterward you will need to complete some details about the product/service you wish to sell. The price can be set from the backend as an individual price (set by the users themselves) or as a unique price. 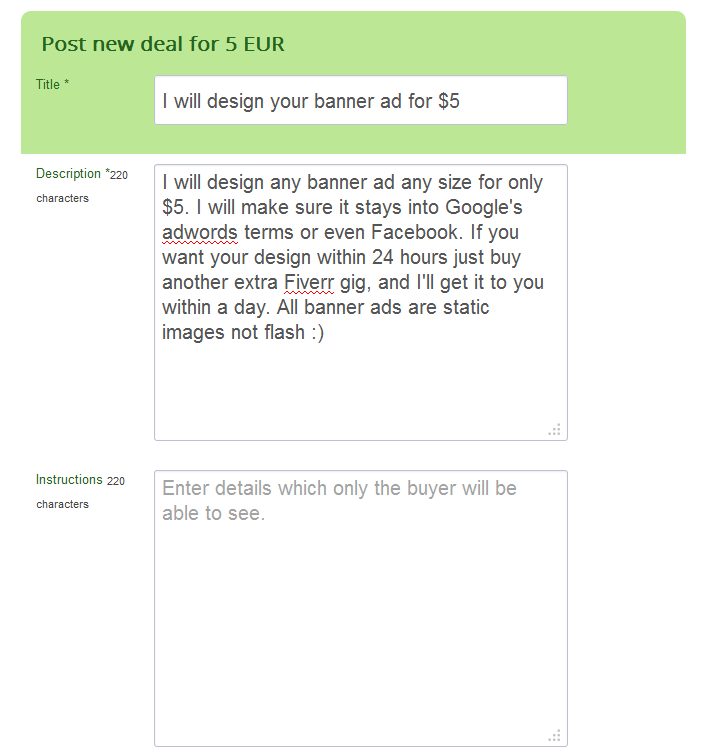 In the image below there is no field for setting up the price so there is a unique price (5 EUR) for all the deals on the website. For more information about this check our Micro Deal Configuration Guide. Add a Title and a Description, these fields being mandatory, that best describe your product. The maximum number of characters for description is 500. The Instructions field can be filled to help the buyer with further details regarding the product/service, which only him will be able to see. With the Timeframe field you can add the duration (in days) of the service or the delivery time of the product. For a better sorting each deal can be assigned to a specific Category, select from the drop-down menu which one is best suited for your deal. Add some Tags related to your deal. Tags allow people to find your deal when using the search function. Write appropriate tags for your deal, separating them by commas. A Start date and an End date can be set as the availability period of the deal. 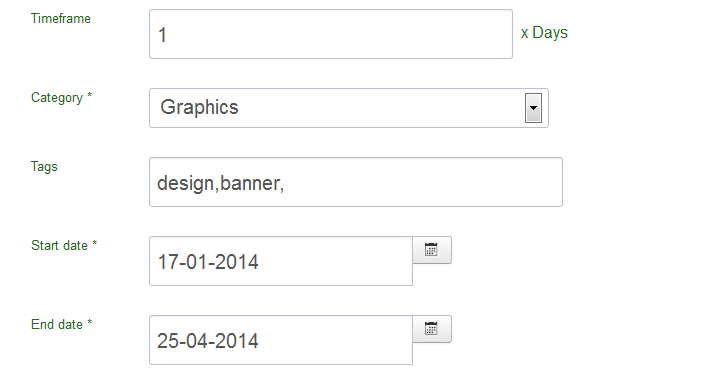 In some situations, depending on the backend configuration, these can be hidden and set as default, starting date being the current time while ending date being undefined. A Quantity field is also available to add how many products you wish to sell. In case all the items are sold the deal will be closed. Using the Order more than one field can allow users to buy multiple items/services from your deal at once. 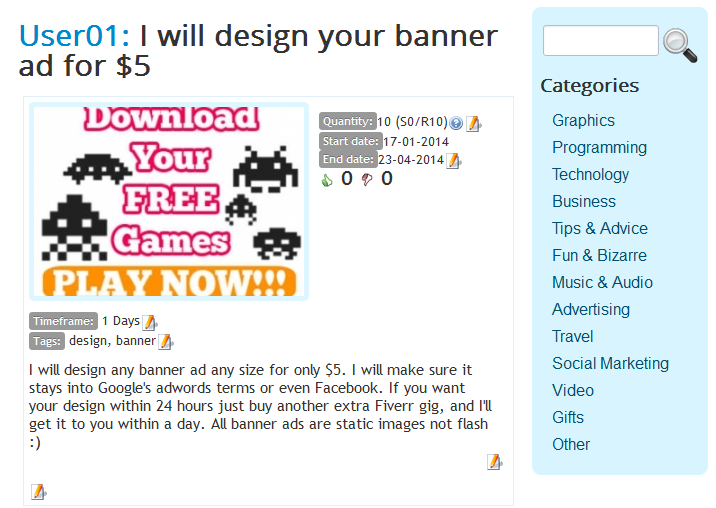 To have a more detailed and attractive deal, you can add Images related to the product or service you wish to sell. The main image can be added, as well as additional images by clicking on "Add more images", which will be seen in the detailed view of the product/service. A Video can also be attached to your deal by adding a Youtube link. 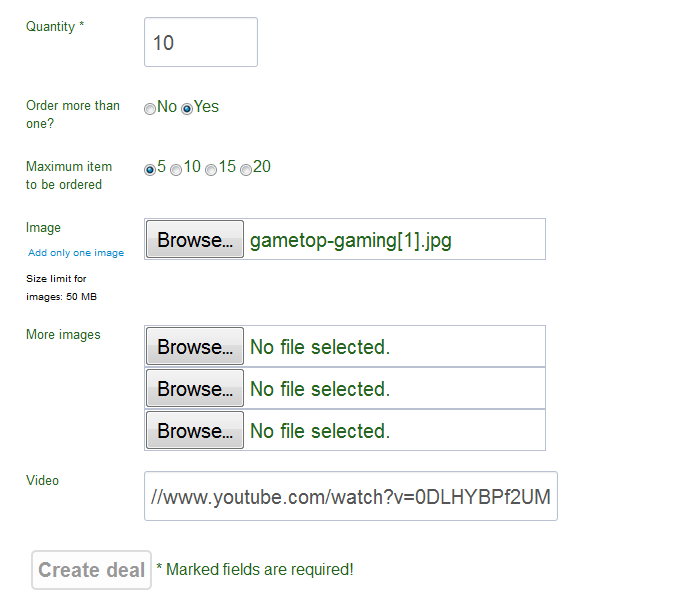 Click on "Create deal" once you are done completing the field above to list your deal on the website. 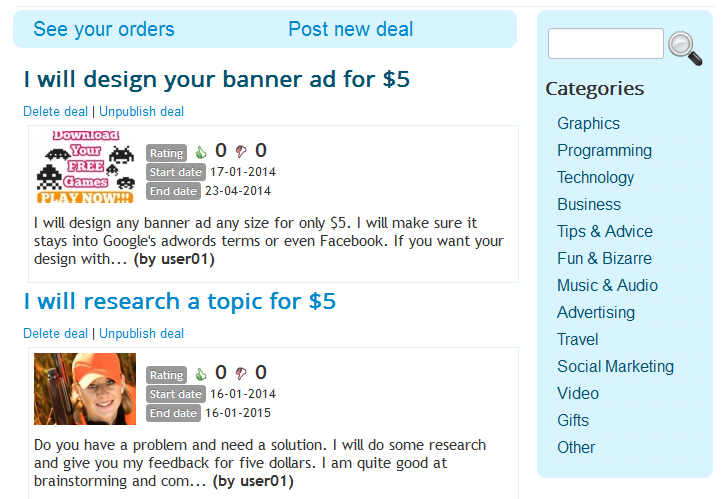 To edit a deal go to My deals from the main menu and click on the one you wish to modify. By pressing on the edit( ) buttons, you can change all the details related to it, such as quantity, timeframe, description, etc. In case you wish to delete a deal, click on Delete deal from My Deals page, and choose the one you wish to remove, and then confirm your action by pressing OK.
From here you can also unpublish a deal, if necessary.